No it’s not a bike... not a car... but something all motorised vehicles must have displayed. The humble tax disc, introduced in 1921. A bit of background. 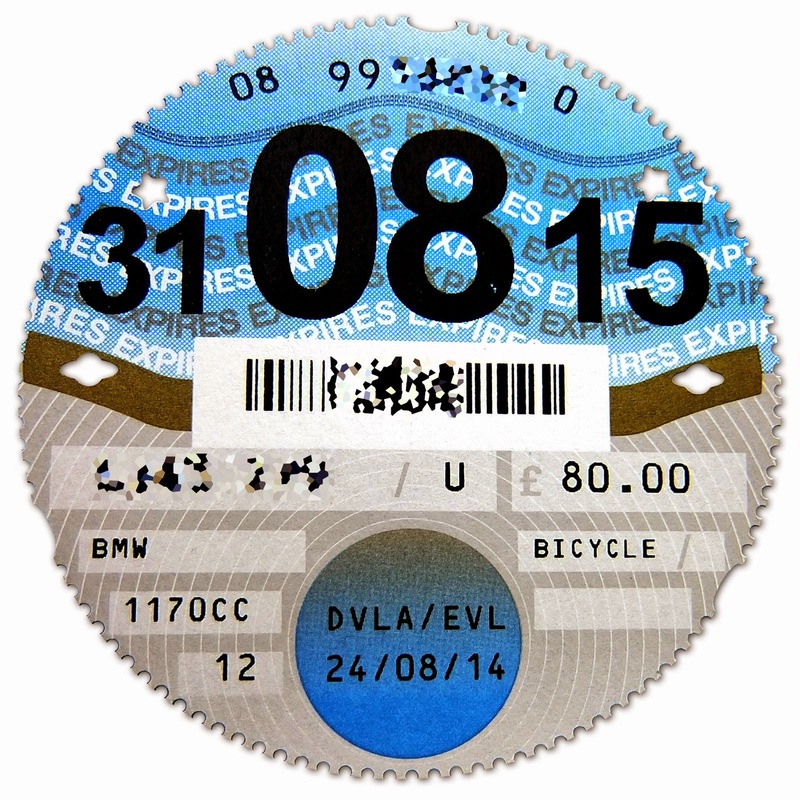 In the UK, all vehicles (excluded those without an engine, such as bicycles) must pay road tax to use public roads. Most recently, road tax for a car is calculated based on CO2 emissions, and for a motorbike (unfairly) based on engine size. For reference, CO2 emissions are related directly to the fuel efficiency of a vehicle. Cars which emits less than 99g/km of CO2—those which are rated at 66mpg or greater (for example, the BMW i range and certain high efficiency smaller cars)—have the benefit of free road tax, but owners still must renew it annually. From 100g/km upwards, the cost is on a scale ranging from £20 (BMW 320d Efficient Dynamics) up to a whopping £500 (BMW 760Li V12) per annum. It’s no surprise, then, that most automakers offer models emitting less than 120g/km and use the low road tax rating as a selling point. Bikes are treated with much more discrimination. Instead of the logical CO2-based car system, the tax is based entirely on engine size. Up to 150cc is £17/year, despite virtually all bikes in this class emitting far less than 99g/km. 151–400cc is £38, 401–600cc is £58 and over 600cc is £80. The BMW F800GS, according to the registration document, emits 89g/km of CO2. Even the hefty R1200GS emits only 99g/km. Both of these bikes would be eligible for free road tax if they were cars, yet each costs £80/year to tax. Less efficient bikes such as the BMW S1000RR (142g/km) or the K1600GT/L (170g/km) pay exactly the same. Put another way, a 600cc sport bike rated at 150g/km pays less than the very efficient F800GS. Absolute nonsense! Ranting aside, what you get for your payment is a round disc printed on ~200gsm matte stock with a perforated edge—this must be displayed on the windscreen (cars) or someplace conspicuous (bikes). On 1 October 2014, paper discs will be no more—from then, new renewals will not receive a disc, and current discs no longer need to be displayed. Today I received in the post the very last tax disc I will ever possess. The end of an era which started 93 years ago, and a symbol which has lasted through generations of British motoring. A bit of trivia... since 1921, more than 1.7 billion tax discs have been issued—more than 42 million last year alone. I can understand the change. Previously, traffic wardens and other officials would routinely check the tax discs on cars when parked, stopped for driving infractions etc to ensure the tax was current, and issue an amazing (up to) £1,000 fine if not. However, with number plate recognition systems installed in most police cars, and a central database of taxed vehicles, this visual inspection has been superseded and offenders simply get a fine in the post. Saving paper, printing, postage and administration costs on 42 million tax discs is sure to save a considerable amount of money for the government—but, of course, none of these savings are passed on to vehicle owners, as the rates remain the same. A lot of people are moaning about this change. Psychologically, people like to have something tangible in exchange for payment, and the little paper disc was indeed a token which could be held in hand. Others argue that it serves as a reminder for when the disc must be renewed, although all owners are posted out a reminder a month before expiry. But I think the real reason for all the moaning is much simpler—nostalgia. A 93 year tradition in motoring has come to a close. Let’s hear your thoughts in the comments below about the end of physical tax discs, and the discrepancy between car and motorbike rates.